It has been six years since Luetta Marley-Goodall and her daughter, Brandie Clark, started A Life Line, a non-profit organization designed to help large farm animals who have been neglected. SMYRNA, Maine — It has been six years since Luetta Marley-Goodall and her daughter, Brandie Clark, started A Life Line, a non-profit organization designed to help large farm animals who have been neglected. 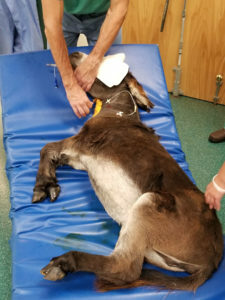 The nature of their job necessitates that they witness terrible abuses against animals on a regular basis, but Clark admitted that she was “beyond shocked” when she was at a fair and first saw a young donkey on display in a stall. The 17-day-old animal, who was eventually named Joy, had a broken neck along with abscesses on the side of her neck. The infection spread deep into the vertebrae in her neck. After the animals are stabilized at A Life Line, they are kept at the rehabilitation farm in Smyrna until an adoptive home can be found. Clark, her mother Luetta Goodall and her husband Gary, are the primary farm hands at the facility. Clark declined to name the location from which the donkey was rescued due to privacy reasons. She said that the animal had never had veterinarian care and weighed only 23 pounds. 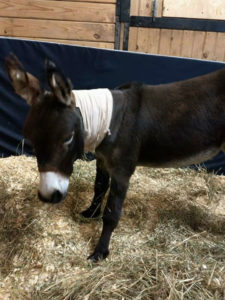 The donkey’s neck apparently had been broken by another donkey, but Joy was never treated for it, nor was she treated for a wound that grew so infected it spread deep into the vertebrates in her neck, according to Clark.. There was a chance that animal’s spinal cord could have been severed by the malformations of the bone pressing on her neck. At A Life Line, however, with care and antibiotics, the animal thrived. “She gained weight and got stronger,” said Clark. The fractured vertebrae were fusing and not an issue until Joy had “a massive growth spurt” a few months later. That’s when Clark and her parents realized that the donkey needed more specialized medical attention than could be provided in the area. Their search led them to the New England Equine Medical and Surgical Center, in Dover, New Hampshire, where Drs. 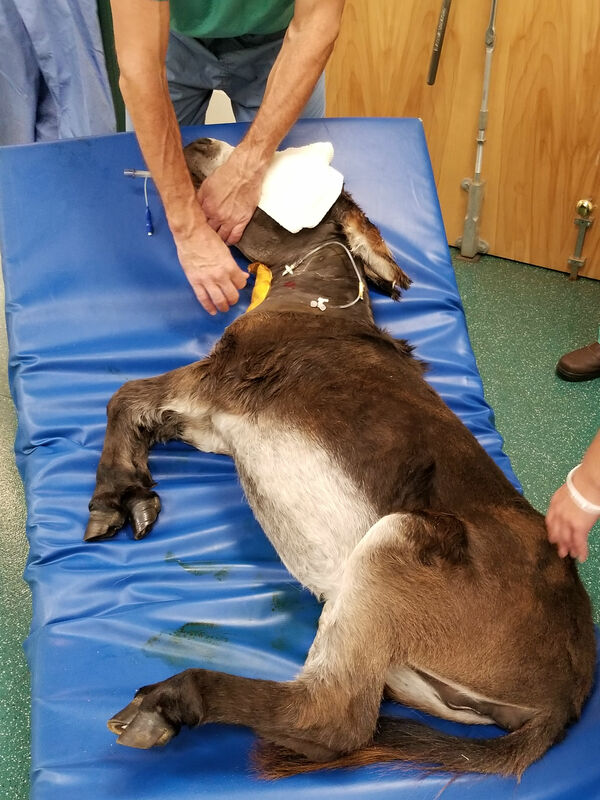 Michael Davis and Barrie Grant performed surgery on the donkey last month that entailed cutting open her neck to fix the vertebrae and remove shards of bones. Dr. Grant, a board certified surgical veterinarian specializing in cervical stabilization, flew in from California to treat the animal. 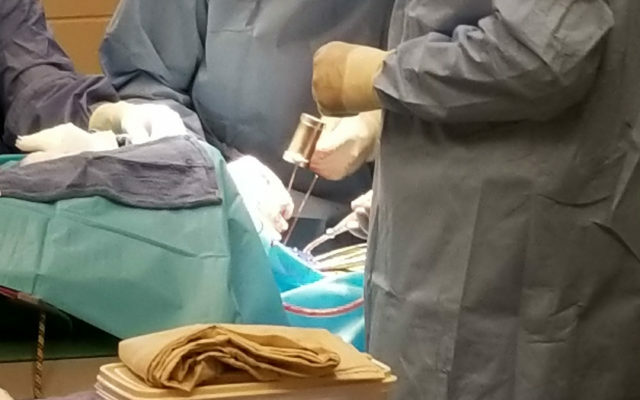 Both he and Davis donated their surgical time to perform the operation. Clark said that the donations of time and care were so substantial that they have to raise about $8,000 to pay for some of expenses involved with the surgery, but far less than the estimated original cost of about $50,000. Joy remains in New Hampshire while she heals. Afterward, the donkey will be returned to the Smyrna facility.